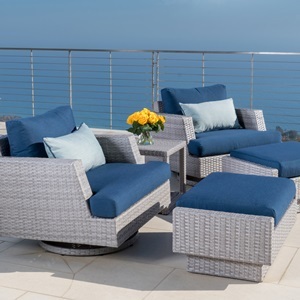 Enjoy your outdoor setting in superior comfort with this 5-piece Motion Club Chair Set. 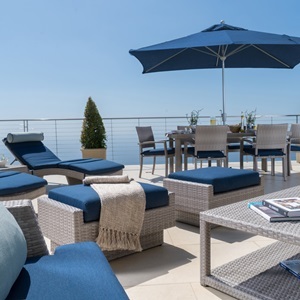 The Portofino Collection is created with distinct contemporary styling, and is built with a durable foundation to provide a place to unwind for years. The Motion Club Chairs feature an integrated 360-degree swivel and rocking motion for deep relaxation. Sink into deep seating and kick back with the club ottomans, while keeping smaller items within reach with the side table. 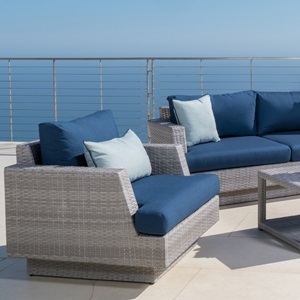 Lightweight aluminum frames are powder coated for scratch and rust resistance, and feature hand-woven SolarFast® resin wicker that will hold up to the elements. Ergonomically designed to sit deep with ample back support. 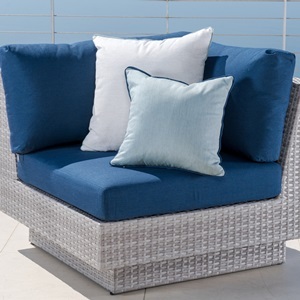 Luxurious 6-inch thick T cushions are wrapped in Sunbrella® fabric with accent toss pillows featuring rich contrast piping.